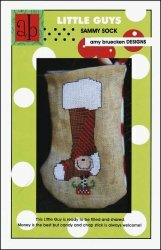 Little Guys: Sammy Sock [D5855] - $6.00 : Yarn Tree, Your wholesale source for cross stitch supplies. This Little Guy is ready to be filled and shared. Money is the best, but candy and chap stick is always welcome! Stitch count 31 x 70.